You're probably familiar with the On The Line campaign to bring awareness to prostate cancer. It's been led by humorous commercials featuring prominent sports figures and celebrities. Now you can see a couple of them doing what they do best: talking sports. 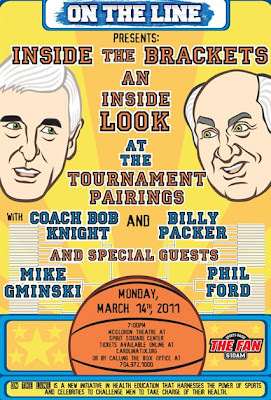 This Monday, March 14, college basketball legends Bob Knight and Billy Packer take you “Inside the Brackets” as they discuss the NCAA Tournament. The event starts at 7 p.m. at McGlohon Theatre at Spirit Square (345 North College St.) and admission is $20. Also featured on the panel are two of college basketball's greatest former players, Phil Ford (North Carolina) and Mike Gminski (Duke). 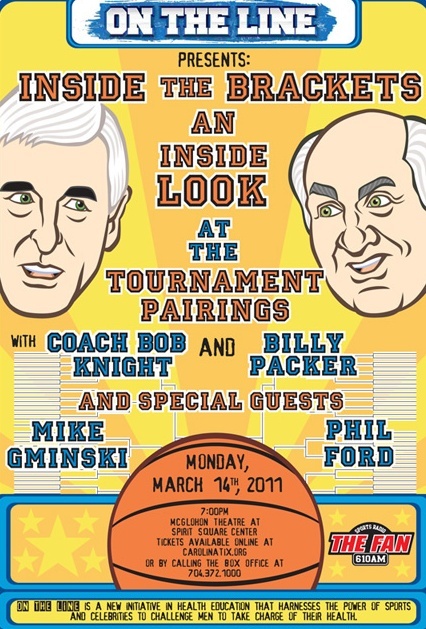 With Knight and Packer, the four of them will discuss topics on the tournament ranging from upsets to anticipate, sleeper picks to watch, under and over-rated teams, and their Final Four picks. Audience members will have the chance to ask questions, debate the panel's opinions, and present their own predictions for the chance to be chosen Charlotte’s most knowledgeable basketball fan. Click here to buy tickets.